With the help of their canine partners, visually-impaired men and women all across the world are able to lead safe, mobile, and independent lives. But what many onlookers don’t realize is that when it comes to guide dog-handler teams, both dog and owner go through extensive training to ensure their ability to work together to navigate routine activities, as well as potentially dangerous situations. In fact, from an outsider’s perspective, it can be difficult to see just how deep this bond between dog and handler goes, when in fact there are a number of rules that should be followed when interacting with a guide dog team in order to keep from disturbing that bond or confusing the animal. In honor of National Guide Dog Month, we’ve compiled a list of things service dogs and their owners want you to know when it comes to training, temperament, and etiquette – from how to handle first-time meetings, to common misconceptions. Be sure to check out Anything Pawsable’s post on Guide Dog etiquette for additional tips. Although “Guide Dog” is by far the most common term, “Service Dog,” “Seeing Eye Dog,” and “Leader Dog” all essentially mean the same thing – the animal is trained to assist his owner, typically one who is visually impaired, with daily life for increased mobility and safety. But a guide dog does not take the place of its human. Unfortunately, many people feel uncomfortable interacting with those with limited vision out of fear of saying something that might be offensive, so the natural reaction is for new acquaintances to focus their attention on the animal instead. However, this is a prominent social anxiety for individuals with sight disabilities. This extra attention is often unwelcome and can be both uncomfortable and isolating for guide dog owners for a number of reasons, but it can also cause the dog to be diverted from its primary job: guiding the owner. Distracting a guide dog by using his/her name, or petting them without permission, is a major faux pas that could have unintended consequences, including an injured owner. The takeaway? Direct your attention to the handler and always ask for permission to pet the dog for the handlers safety. Ask any guide dog owner or trainer and they will tell you the same thing: the bond between handler and animal is a force to be reckoned with, one that combines love and friendship with serious mutual responsibility for one another. In a handler-guide dog team, the dog doesn’t lead the owner and the owner doesn’t completely control the dog; both individuals work together to get to their destinations and to manage day-to-day activities. It’s for this reason that guide dogs and their handlers undergo rigorous training before coming together as a team; both parties must learn their individual roles first. Before being paired, and often before even meeting, a guide dog-handler team will have approximately three years of training mastered. But it never stops. Being someone else’s eyes and ears can be a major challenge, which is why whether they’re learning to walk like a guide dog, handling on-duty downtime with patience, or leading a handler through tricky situations such as public transportation, service animals are constantly absorbing, adapting, and mastering new commands. But they are not perfect, and they do make mistakes. Just as with any training, human or animal, repetition is necessary, as is reinforcement and reward; often a simple tug on the harness, and extravagant amounts of praise when the dog makes the connection between a command and the proper reaction. Why? Mastering these new commands could very well save the handler’s life or prevent injury or unintended safety threats — so while the training itself may seem serious, there is no shortage of reward! While most canine pets learn to associate their name with their owner’s commands based on vocal inflection, service dogs have to take this association to another level, recognizing their handler’s commands and cues instantaneously. As a guide dog gets more and more experience with its handler, it may be able to take on more responsibility. For example, many veteran guide dogs know all of their master’s usual destinations. All the handler has to tell them is “go to the office” or “find the supermarket,” and the guide dog will follow the complete route! This is part of their continued training. Additionally, a guide dog must learn to disobey any command that would put the handler in danger. This ability, called selective disobedience, is perhaps the most amazing skill that guide dogs possess – the ability to balance obedience with their own assessment of a situation. This capacity is especially important at crosswalks, where the handler and dog must work closely to navigate the situation safely. When the team reaches a curb, a guide dog is trained to stop, signaling to the handler that they have reached a crosswalk. Since dogs cannot “read” a “WALK” sign, the handler must make the final decision on when it is safe to proceed across the street by listening to the traffic, and giving the “forward” command. If there is no danger, the dog will proceed across the road in a straight line. If there are cars approaching, the dog is trained to ignore the command, wait until the danger is gone and then obey. As this instance shows, it is crucial that both play their role in assessing and communicating during challenging situations. Through their training, the guide dog must learn to spot and respond to threats to their handler’s safety, even though the owner may not realize the dangers.” It’s all a part of the carefully orchestrated bond and mutual responsibility of the team. While guide dogs are always in training while on-duty, during their downtime, they are just regular dogs: rambunctious, social, silly, cuddly, photogenic… Once a guide dog gets home, off come the leash and harness and out comes the relaxed, lovable family pooch. Guide dogs know that to be in their harness is to be responsible for their handler’s well-being, but off the streets, they are free to just be themselves! Up until the 1940’s many guide dogs were rescue dogs, taken in from shelters and trained according to the standards of the day. However, as the guide dog training program evolved, many guide dog schools realized they needed an adaptable combination of temperament, obedience, and healthy characteristics that would make the dogs more responsive to their rigorous training, as well to praise. 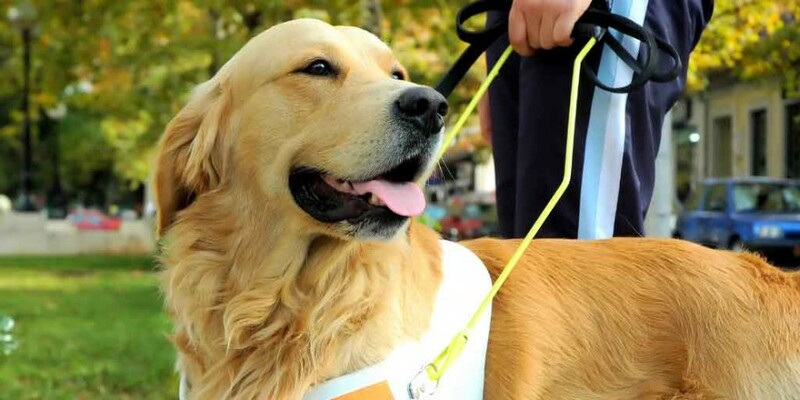 While any breed can be a service animal, guide dog schools typically favor Labradors, German Shepherds, and Golden Retrievers for their exceptional obedience and sociability, as well as their ideal size for both confident guiding and mobility. Since the cost to graduate a dog-handler team can exceed over $50,000, careful selection of candidates is crucial to enabling schools to provide dogs to those in need for free. For this reason, of the puppies brought into the program by trainers, approximately 20% of the pups will be released from the program for various temperamental or health reasons. All this means is that every graduated guide dog is truly the pick of the litter! Despite these industry trends, there are still a number of companies and groups that focus their efforts on rescuing shelter dogs and training them as guide dogs, including Dogs for the Deaf and The Guide Dog Foundation for the Blind. Other organizations, like Freedom Service Dogs of America, rescue shelter dogs to be trained in assisting individuals with other physical and learning disabilities such as Cerebral Palsy, Muscular Dystrophy, Multiple Sclerosis, and Autism. While it’s true that some pups don’t make the cut to a guide dog career, this is primarily because dogs-in-training ultimately have their own choice in the matter. For dogs that choose against a guide dog future, there are a multitude of options available to them in service industries, or in simpler lives as family pets via internal or external adoption. As “Career Change” dogs, trainers can explore their canine’s propensity for law enforcement, search and rescue, even therapy or learning disability assistance. Looking to adopt a retired or career change guide dog? There is a rigorous application and adoption process consisting of interviews, regular follow-ups, and training — but the red tape is well worth it! There are a number of schools and trainers looking to re-home their dogs, including Guide Dogs of Texas and Guide Dogs for the Blind.